Apple announces iPhones 6S and 6S Plus and iPad Pro. 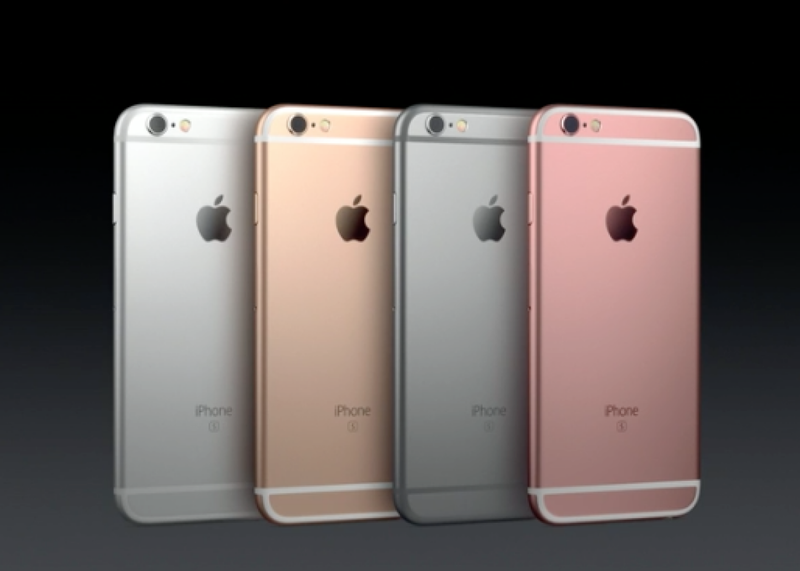 The new iPhone 6S and 6S Plus colors, including rose gold. Apple’s tagline for this year’s product refresh is “The only thing that’s changed is everything.” Ugh, right? Most odd years, Apple’s fall event is kind of boring, because the iPhones are on their S iteration, so they don’t get significant redesigns. But I have to say, Apple delivered some cool stuff Wednesday. Not everything has changed, but there’s actually some novel tech here. At an event in San Francisco, the company led off with a surprise iPad announcement. Rumors about a large-screen iPad have been swirling for years, but we didn’t know for sure that the product would debut Wednesday. The iPad Pro features a 12.9-inch screen for easier multitasking in iOS 9, more immersive movie watching, and more expansive gameplay. The current iPad Air 2 has a 9.7-inch display. The iPad Pro screen has 5.6 million pixels (compared to a little less than 5.2 million in a 15-inch MacBook Pro), and its width is equivalent to the current iPad’s height. The iPad Pro has a faster processor than previous iPads—the new A9X chip—and Apple made two custom accessories to go with it. There’s a physical keyboard/stand (that brings Microsoft’s Surface to mind) and a specially designed “Apple Pencil” stylus that has pressure sensors and processors, so it can work more like an actual pencil or brush would. And you can use it simultaneously with your fingers. Apple is mainly targeting the iPad Pro at business customers, and Wednesday’s demo even included an explicit plug for Microsoft Office, showing multitasking with a Word document and an Excel spreadsheet side-by-side. But the Apple Pencil also allowed the company to show how the iPad Pro could be inviting and creative, not just boring and corporate. The bottom line, though, is that it’s just an enormous and expensive iPad. (It weighs 1.57 pounds, as much as the original 2010 iPad did.) Pricing for the 32GB model starts at $799, and $949 for the 128GB model—it costs more to add LTE—plus the Apple Pencil is $99 and the keyboard case is $169. But as usual Apple is trying to deliver something that’s better, faster, and more sophisticated than the competitors out there, and the company seems content to pursue enterprise customers while letting the iPad Pro naturally find a niche in the consumer market—or, well, not. As for iPhones, the 6S and 6S Plus debuted as expected, and they look the same from the outside (with the addition of a rose-gold finish option). And though no product could ever truly live up to the spectacular height of Apple’s promotional jargon, these new iPhones really do have some differences inside. The biggest change is 3D Touch, the mobile version of Apple’s Force Touch introduced on the Apple Watch and MacBook trackpads earlier this year. As Apple’s senior vice president of software engineering, Craig Federighi, said repeatedly, 3D Touch allows you to “peek in” at what’s going on in an app or website without actually changing apps. On the homescreen you can 3D Touch apps to see shortcuts to actions you might want to take. In iMessage you can manage your calendar, see flight times, or look at a Web page without ever leaving your messages. “It lets me take actions on apps without even having to open them,” Federighi said. Groovy. The new phones come with A9 processors and M9 co-processors for faster CPU and graphics performance, an updated TouchID sensor that’s twice as fast, improved LTE and Wi-Fi connection speeds, and a 12MP camera that can take “Live Photos” that show a little bit of what was happening on either side of the still. (Very reminiscent of photos in Harry Potter.) Plus the front-facing camera is going to use a software-controlled “flash” from the phone’s screen as the flash for selfies and other photos taken with that camera. These are the incremental improvements we expect from an S year iPhone update, but combined with the hardware changes for 3D Touch, Apple has delivered on its self-promotion far more than it did in previous years. And Apple seems to be feeling good. Phil Schiller, Apple’s senior vice president of worldwide marketing, said toward the end of the demo that the company will start offering a Move to iOS app in the Android app store to make transitioning from Android to iPhone easier. He said, “It’s the neighborly thing to do, right?” But Apple can never afford to get complacent. CEO Tim Cook said at the beginning of the event that, “We are driven to innovate at Apple.” It could be a curse as much as a gift, because to stay on top, the drive can never falter.